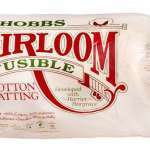 Hobbs Heirloom FUSIBLE batting – 80% unbleached cotton/20% polyester blend. Easy to baste your quilts as no pinning required, just layer and fuse in place. 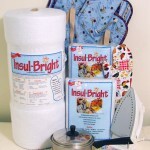 It is lightly needlepunched & lightly resin bonded and has a heat activated fusible on both sides. Can be quilted by hand or machine up to 4in apart. After washing the fusible will be washed out. 96″ wide, sold by the YARD. Please order the number of yards that you need (anything from 0.5 up) and it will all be cut as one piece. 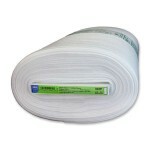 Would not be without this Hobbs fusible wadding – makes life so much easier when quilting and at such a good price at Sew Hot. Delivery very quick – praiser all round. 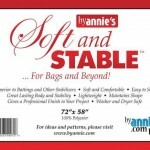 I love this wadding, so simple to use and a great price at Sew Hot. 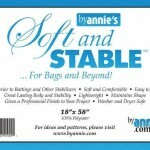 The service was great too, I ordered on Tuesday afternoon and received the package on Thursday. Arrived in reasonable time, but was cut so squint that it was less than the 2 yards I’d ordered (only 70″) at one end. I’m going to have to cut it in the other direction from what I’d planned, which means I’ll have a much less useful bit left over. Pain! Alison – We are sorry to hear we miscut your order. We will reship it straight away and apologise for the error. This is lovely and soft, and has made the whole pinning/tacking thing SO much easier. I’m very pleased with it, and with the excellent response I got from Rebecca when something wasn’t quite right. That is truly great customer service. Thank you, Sew Hot! What a boon finding this has been! I used to dread basting a quilt and often needed a friend’s help but now I can do this on my own and in a quarter of the time. Just used the wadding and it was easier than pinning and basting although I did find it needed more heat than suggested., I had the iron on the hottest temperature. Service from SewHot was very good, the parcel was well packed and arrived very promptly..
Would use this wadding and SewHot again. The most convenient way to use batting! No longer am I fiddling about wit h safety pins every few inches. You do need to make sure your iron is hot enough or it doesn’t stick well but once you’ve got that right it’s a dream. I waited for this to come back into stock rather than go back to traditional batting. Service is excellent and always arrives I good time.